A few weeks ago, on January 9th, I received a Toshiba 4000CDT laptop computer. My first impression of my new computer was the packing box - it wasn't marked with the word "computer" in any way. I guess this strategy reduces the chances of the unit getting lost or stolen during transport. The packing material securely protected my unit quite well from shocks. Toshiba included a list of parts which helped make it easy to find out if any of parts were missing. 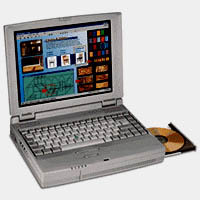 The laptop weighs about 6.7 pounds (3.04kg) and has a 12-inch (30.48cm) SVGA (800x600) active matrix display screen. Ports are located on the back of the unit and were easy to recognize, except for the infrared port, which I had not seen before. It took me a while to find that the power switch was hidden under a cover on the left side. While I skimmed the instructions for important details, I plugged in the AC adapter to charge the battery. It took 2 or 3 hours to completely charge the battery with the power tuned off (and takes longer, if it is running). The modem is housed under a small door on the right side, but unfortunately this door seems quite flimsy and could be easily broken if it was ever left open while handling the computer. I almost broke it when I checked for the serial number. The telephone (RJ-11) jack on the modem also looks flimsy. In laptops, I prefer modems to be solidly built into the computer, flush with the case. This unit sticks out almost 3/4 of an inch(18 mm). The right front side of the Toshiba also houses the 24X speed CD-ROM drive. This design then forces you to put the mouse pad about six inches away from the keyboard, so CD-ROM tray won't bump into the mouse pad when it opens. With no devices located on either the front or left side, this unit seems to have been designed by a left handed engineer. Although I might be able to eventually train myself to use the mouse left handed, I will still have to place my notes away from the keyboard. It will take me a while to get used to this AccuPoint ("eraserhead") pointer and people tell me it might be easier to use than the mouse. Rick Smith, a Reviews OnLine editor, tells me he loves the eraserhead pointer on his IBM Thinkpads. The keyboard is fairly standard and includes 84 keys including 12 function (F) keys, most of which I never use. The name PrtSc key should be changed since it never seems to print what's visible on the screen - I wish it did, that would be a lot easier than pasting from the clipboard into Paint (or other suitable program) and then printing from that application. One of the function keys (F3) is supposed to put the computer into the standby mode, but I haven't been able to get this to work, either. The right shift key is crammed between the Enter key and the arrow keys, so I sometimes hit the wrong key when I am trying to "shift" for a capital letter. The left Shift key is next to the Ctrl key, so I sometimes also get these keys mixed up. If I had smaller, more dexterous hands, this might not be a problem, but this slows down my work. The processor clock speed (Mobile Pentium II 233 MHz) is faster than any computer I have ever used before, but it really doesn't affect what I do, since I don't work with large spreadsheets or graphics programs. The DRAM memory (32 megabytes) also seems to be quite adequate for my needs. Since it may take me decades to fill up the 4.1-gigabyte hard disk, I am quite lax about checking my free space, since I have over 3 gigabytes free. The floppy drive (on the right side over the CD-ROM) has an eject button that protrudes only if a diskette is in the drive. This feature will keep me from breaking this button off, like I did with my last laptop, a Compaq Presario 1010. Fortunately, the 270 page instruction manual reads like it was written by someone whose first language was English, unlike manuals I have read from other Japanese products, but its index is inadequate. Terms that I am familiar with are listed in both the index and the glossary, but unfamiliar terms are not listed nor even mentioned. This manual states that the AC adapter must be unplugged when the battery is fully charged. I find this to be bothersome, worrying about when to unplug. I had planned to get a second battery, but since it costs over $250, it seems to be an extravagant luxury. A scroll lock key is on the keyboard, but the manual doesn't explain what to use it for. The same holds true for the Pause Break key. The 4000CDT came preloaded with Windows '98 and I own a copy of MS Office '98. Included in the box was something called a Configuration Builder CD (containing Windows 98 and important installed files), and a Toshiba Companion Diskette (an emergency boot disk). I was able to configure Windows 98 for my Epson Action Printer model AP3250, 3COM Noteworthy 56K modem, and Microsoft mouse without any trouble. This process was truly "plug and play". Overall, the display is great and I can live with the small keyboard and the other problems - the Satellite 4000 CDT has the features I need. Hopefully, it will outlast other computers I have had, since my first Apple II. Copyright © 1999 J. Paul Jones All rights reserved.